Recently, I have finished the first book in this compilation, and now I am up to the second book, called Jasper Zammit the Striker. The book starts off with Jasper dreaming about scoring a magnificent goal for a famous team, Real Madrid. His Grandad, Nonna, was a great soccer player back in his time. He told Jasper it’s necessary to practise boxing, athletics and dancing to improve your game. Aamir, a boy who can’t speak English, scores lots of goals for Jasper's team, the Rovers. The problem is, the Eastville Kings star player, Badger has a ‘role’ to put people off in the game. The Rovers hope Badger might be caught red-handed by the referee and be sent off for a red card. This is a cool series. I really like all the drama and all the soccer action. I would recommended it for ages 7 to 13. Johnny Warren was a real-life Australian soccer legend - a Socceroo captain who championed 'the game of life' long after he hung up his boots. 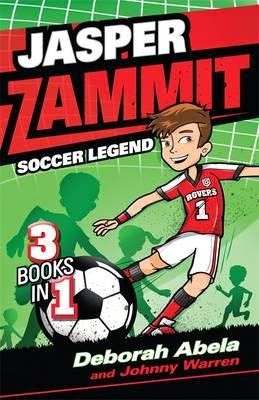 Johnny was passionate about encouraging kids to play and enjoy soccer - so the Jasper Zammit books are jam-packed full of his facts, tips and stories.